Having the right countertops can make a difference between loving and hating your kitchen! Estimate accurate countertop prices, with different edge options for: granite, corian / silestone, quartz, wood, metal, laminate, and recycled materials. NOTE: Estimated countertop costs include design, template delivery and installation. 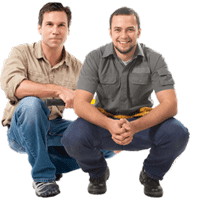 There is also a basic “fee” of $750 included with all price quotes – this is what most contractors would charge for Template Preparation. 1) Size – You can measure or “guesstimate” the size of the job – just enter the size in square feet in the first box. In most cases a countertop is considered 2 feet deep – so just measure the length of your counters, and multiply it by 2, to get the size. If you have an Inside Corner, add 4 sq.ft. 2) Materials – Select the material type that you want to have installed. 3) Color – Select the color you want. Note that in most cases you should use “Standard” option, until you actually see the colors that your contractor is offering, and know which are Basic, Plus and Premium. 4) Edge Profile – Select Edge Profile – refer to our EDGE PROFILE GUIDE. In most cases you can select Basic (A option) or Better (B option). If you are estimating laminate countertops, the price calculated will be a little higher than the actual price, as custom edges for laminate cost significantly less that those for Granite or Corian. 5) Removal of old counters – Select YES if this is a kitchen remodel, and NO if it’s a new construction / addition. 6) Project complexity – This is a very subjective variable, but if you have inside corners, odd cut outs, diagonally spaced sinks (in the corner), or if you want as few seams between countertop sections as possible (this typically applies in the installation of Granite, Quartz and Corian), you should select “more complex” or “very complex” to get an accurate quote. 7) Cooktop cut-in – the name says it all. If you plan to have a counter-mounted cooktop range, select yes. You can also request no obligation free estimates from local contractors, who specialize in kitchen countertop installations. When remodeling a kitchen, the average cost to install new counters is $3,500-4,500. This includes removal of the old counters, sealing, grouting, doing the edges and cut outs. 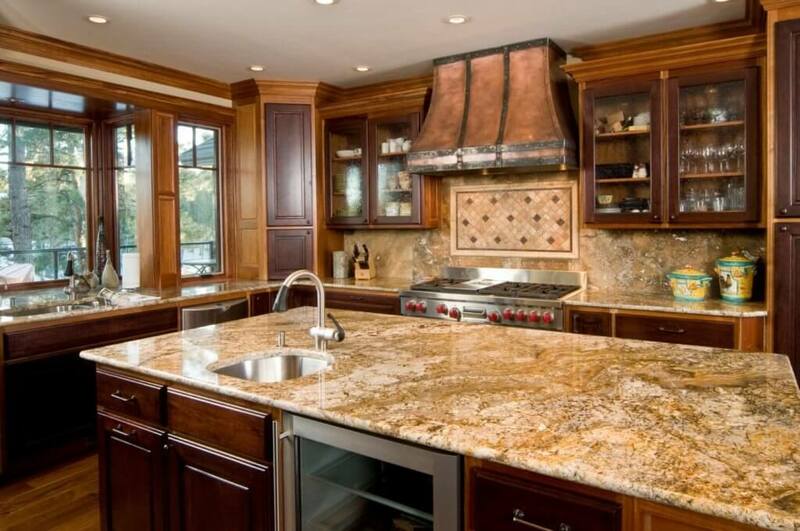 Typically, homeowners report spending $55-90 per square foot on new kitchen countertops. However, depending on quality and style, prices can be as low as $30 per square foot and as high as $225 per square foot. Its important to keep in mind that each type of counter material has its own features, benefits and disadvantages when it comes to spills, cooking, cleaning and maintenance. Also, you will discover that a particular material may greatly vary in price. This is because there are different quality grades, thicknesses, finishes, etc that can make it more or less expensive. For example, premium quality granite can cost as much as quartz, which is on average 20-30% more expensive than basic quality granite stone. Here is a chart that compares features and prices per square foot for the most popular types of kitchen counters. Laminate $20 – 60 most affordable option, diverse range of colors and styles will not last long, less durable than stone or wood. The majority of homeowners looking to install new kitchen counters debate between quartz and granite. Quartz countertops are quickly growing in popularity because of their versatile looks and a more modern aesthetic. Today, there are hundreds of colors and styles to choose from, manufactured by brands such as Silestone, Cambria, Zodiac, Caesarstone, etc. Still, granite remains extremely popular with a vast majority of homeowners, because it offers durability and a classic appeal that works well in most kitchens. Each slab of granite is completely unique, and the stone lasts for decades when properly sealed and cared for. One of the greatest advantages of granite is that lower quality grades can be installed for a rather low price, around $40-50 per square foot. A growing trend is to use recycled and eco-friendly composite materials made out of glass, concrete or paper. They are less expensive, better for the environment and offer a wide rage of designs and colors. Many modern style kitchens now make use of these countertops. A popular designer trick is to combine different countertop surfaces (polished vs unpolished) in one kitchen. Mixing and matching materials is another great option. A favorite among homeowners is to install butcherblock on a kitchen island, and use natural stone on the rest of the counters. This adds a lot of visual interest and warmth to a kitchen’s ambiance. 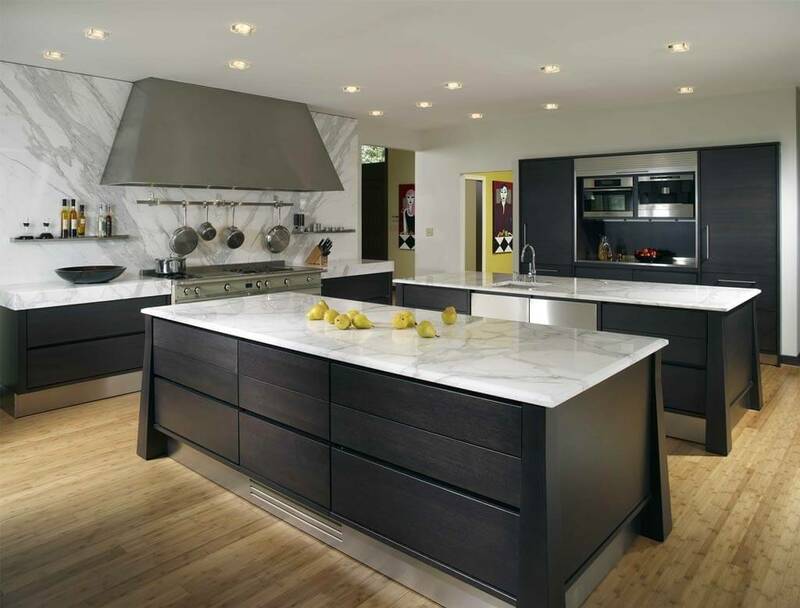 High-end, contemporary kitchens can benefit from “smart” composite materials. These nano surfaces are heat and scratch resistant, come in a variety of bold colors and look very sleek. One such popular product is “Glassos“, a crystalized glass surface countertop, or “Fenix NTM” composite nanotech material. Installing new countertops is one of the most expensive items on the bucket list of kitchen remodeling. However, if you are on a tight budget, there are ways to save money, while still getting a beautiful counter that you will love using. Whether you want a natural stone (granite, marble, soapstone) or quartz, the rule of thumb is that patterns and fancy color variations cost 30-40% more than more uniform looking slabs. Moreover, when you pick a very prominent looking stone, your entire kitchen design will need to match it in order to look good. This means your cabinets, flooring, backsplash, etc will all need to conform to the color and style of the countertop. This limits your design and product options in the present, but also in the future. A stone counter will last for decades, and you may easily got through 2 cabinet and tile replacements in that span of time. A smarter option is to install counters that are less overbearing and will easily complement a variety of cabinet colors and styles. if you are in love with the majestic look of marble, but can’t afford the price tag, consider quartz. There are many products that are designed to replicate the look of marble, and their cost varies. For example, Cambria quartz has a special collection of products that look like marble, called “Torquay”. Some quartz replicas are very expensive, in the ball park of $90-120 per square foot, but others are a lot cheaper: $60-80 per square foot. In any case, you can save at least 20-30% by installing a man-made imitation of a natural stone countertop. 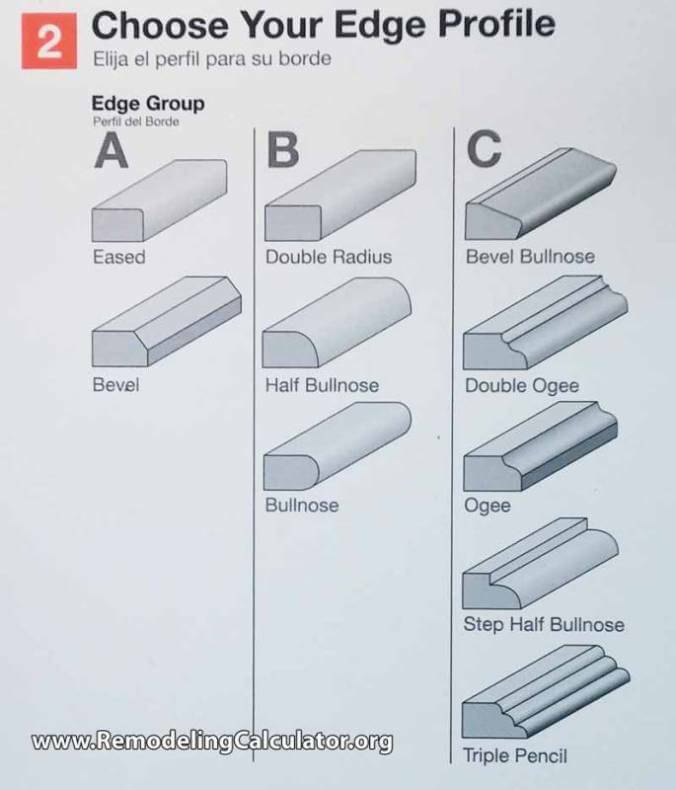 There are usually 1-2 edge styles that are included in the base price of the countertop, and this is what you should select if you are trying to keep expenses down. 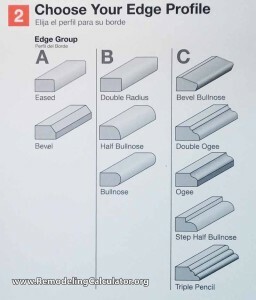 Fancier edges such as bullnose, waterfall or ogee, can easily add 15% to the total price. Lets face it, most kitchen counters are always filled with stuff, often to a point where you barely see the surface. If that is the case in your house, why waste money on a fancy beautiful countertop that you will not even see that often? Instead, go with a cheaper material on the main cooking surfaces, and spend more money on a fancy kitchen island top. If you have a small kitchen, you may be able to get away with purchasing remnants of a few large slabs of stone and piece them together. Many stone wholesalers will offer as much as 50-60% off on these left over pieces. Its best to go to a local wholesaler vs. a small fabricator because you will have a much larger selection of stones to consider. Many homeowners worry that if they go for a low cost countertop material, their kitchen will look unattractive and dated. Nothing can be further from the truth! 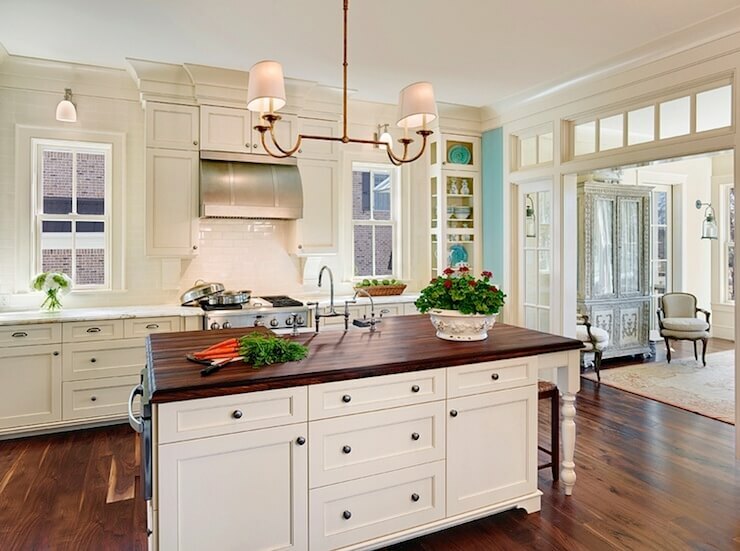 There are beautiful butcher block, tile, laminate and composite counters that have plenty of designer flare, but cost at least half the price of upscale countertops. For example, Ikea sells affordable laminate counters that look very stylish. If you are completely redesigning the layout of your kitchen, you can save money by creating a layout that will not require the stone or other material to be cut many times. The more cuts, the higher the cost. Also, things like sink and faucet cut outs each cost a few hundred dollars extra. One way to avoid these additional costs is to install a farmhouse rather than an undermount sink (which is what most homeowners install without thinking about the associated spending). If your current kitchen counterts look very old and stained, its best to replace them before putting your house up for sale. The kitchen is one of the biggest points of interest for prospective buyers, and if they see dingy counters, it may be an immediate turn off. Also, many people don’t like to buy homes where they will be required to spend extra money on expensive renovations, such as replacing counters in the kitchen. 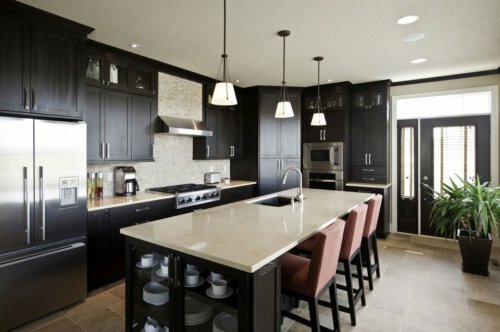 You best bet is to go for granite or quartz counters, as both materials are highly popular with homeowners. There is no need to splurge on top of the line, higher grade products, because you will not see a high ROI at resale. Instead, go for neutral, modern looking slabs in the range of $45-60 per square foot. This is a safe figure to spend in order to get a good return and shape up your kitchen. Most realtors and interior designers advise against installing very colorful and bold looking countertops if you plan to sell your house in the future. What is in style today may not be in 5 years from now, and your aesthetic taste may not match the one of next home owners. If you are remodeling a rental property, unless its an upscale apartment, you can easily get away with installing laminate or corian countertops, at under $30 per square foot. They are inexpensive, functional and look good enough to satisfy the tastes of most renters. In 99% of cases, homeowners cannot do Granite / Quartz and other countertops themselves, because those need to be fabricated by a specialized shop. Usually you also cannot just buy a granite slab. As far as cost in this calculator – they are based on what actual countertop contractors / companies charge. For example, basic Granite will cost about $40-45 per sq. ft. installed. Home Depot will be around $45-50. Some premium shops can be as high as $50-55 per foot for cheapest granite. Now you can always find companies that will do the work for around $30/ft, which is what I did. But those are few and far between. So I base these numbers on average between different companies. Now quartz – same thing. Basic color will be around $55-60 ( Home Depot, Ikea, most smaller shops), but my countertop contractor’s quartz starts a t $40/sf.